1. Red lines 5yd apart. 2. 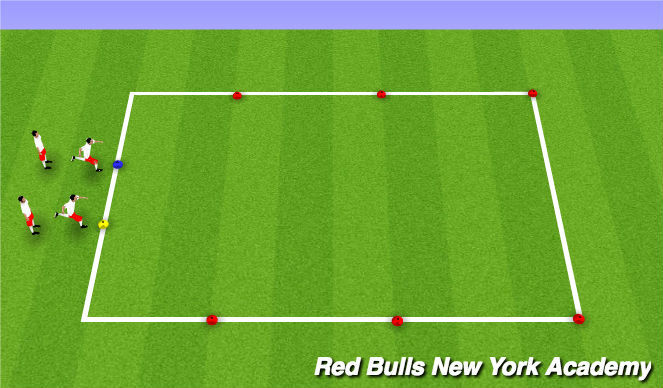 Players set up as shown at cones 2yd apart. 1. 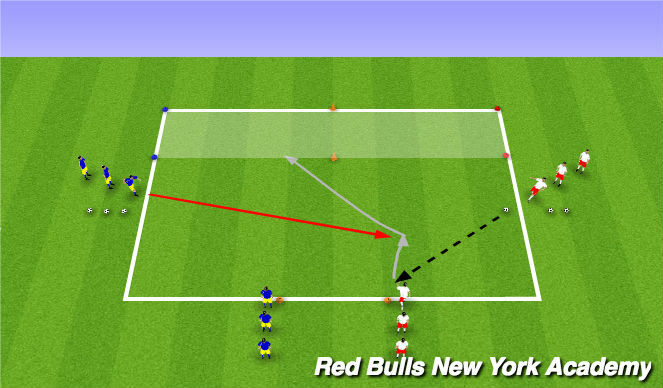 Following juggling routine, players split up into two lines. 2. Players on blue line are attackers. 3. Players on yellow line are defenders. 4. Attacker looks to beat defender across red line(s) marked by red cones. 5. Attacker wins a point if she crosses a full arm&apos;s length or more ahead of defender. 6. Defender wins a point in case of a draw. 1. Change direction/speed to fake defender. 3. Recognize space - look up. 3. One ball and cone per player. 1. Review from previous session. 2. V-moves: same foot for entire movement and, two feet (pull back one foot, push forward other foot). 1. Combine - one foot into two feet. 2. Competition - first player to 20. 2. Players work in groups of 3. 3. One ball per player. 1. First player from each line dribbles to halfway, performs L-turn and speed dribbles to end. 2. Next player goes as soon as player in front reaches opposite line..
1. One group moves to opposite side. 2. First player in each line dribbles towards the middle. 3. Players perform L-turn to go around each other. 4. Next two players go upon making eye contact. 1. Head up to observe space. 2. Connect with teammate - eye contact. 3. Quality of approach - Messi touches. 4. Accelerate away - Ronaldo. 6. Hip and head movement. 1. Competition - which group can finish first or do most in two minutes. 2. Players set up as shown. 1. Objective is to penetrate into endzone (shaded area). 2. Server passes to teammate. 3. Defender from opposing team is live on pass. 4. 1v1 to endzone, extra point if attacker is able to cross on opposing team&apos;s side of orange cones. 5. Next turn starts with other side. 6. 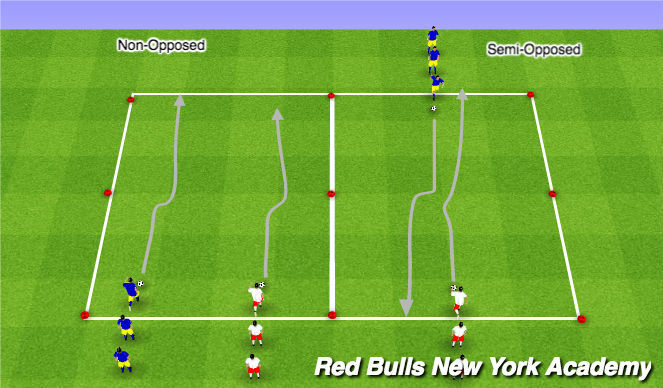 Rotation: attacker becomes server, server stays to defend next turn, defender joins attacking line. 1. Attack space - big first touch. 3. Recognition of defender&apos;s approach (speed and angle). 4. Timing and execution of move. 1. If defender wins possession, look to dribble across starting line. 2. Four teams, two games at once. 2. Restarts with kick-ins. Corners from own goal. 3. Five minute games then switch opponents. 1. Three lines of attack. 2. Movement to create angles. 4. Decision-making: moments to play forward.